Alright! Reporting from Snowbird, Utah right now, tired from a long day skiing. My English teacher once told me that writing is like a miniskirt: it should be long enough to cover the subject, but short enough to keep it interesting. I plan to make this entry short and concise. Now that the valve train is assembled, the only thing left to do before the intake manifold went on was to check the rocker arm-to-valve tip clearances. After the fact, we learned that because we’re using a stock cam (as opposed to a race cam) we only needed to tighten down the rocker arm nuts until there was no play in the pushrods, then give them an extra 1/2-turn. Instead, we adjusted each valve to a specified clearance with a feeler gauge. As if this wasn’t difficult enough, each valve must be adjusted when the lifter is in a specific position relative to the cam lobe (determined by finding Cylinder 1 TDC to start), and then turning the crankshaft first 180 degrees and then another 270 degrees to finish adjusting the complete set of valves. Out of the shop manual and three books we were looking at, only one gave us the information required to accurately carry out the procedure. 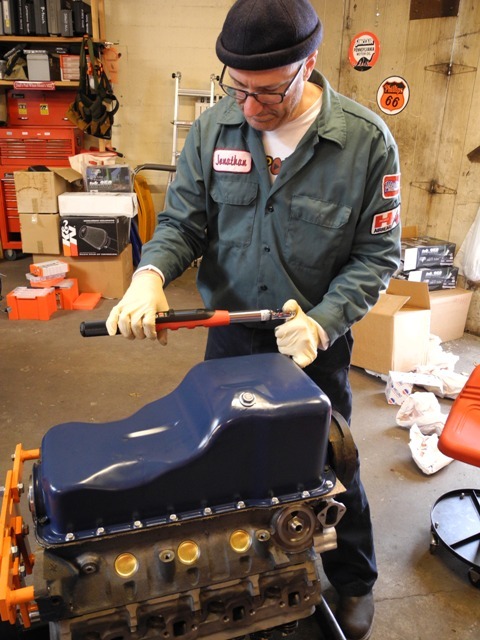 It took us two tries to get it right: after our first attempt, we knew we had done something wrong when all of the rocker arms we tightened were coming off the valve tips after moving to the second set of adjustments. Once the rocker nuts were all tightened correctly, I applied gasket shellac and silicone sealant to the intake manifold-to-head gaskets. 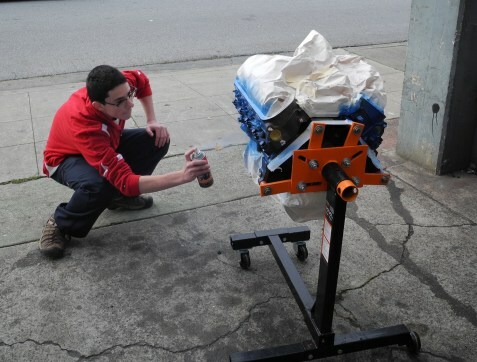 Rather than using the cork gaskets that came with our gasket kit for the front and rear of the intake manifold, we decided to use silicone sealant instead; We’ve heard that the cork gaskets have a tendency to be squeezed out when the manifold is torqued down and are a common failure point. With the intake manifold (newly cleaned and shined from the machine shop) attached to the block, we turned to the bottom end to install the new oil pump. We re-used the old stock oil pickup, which cleaned up nicely in our parts washer. We applied silicone sealant to the oil pan gaskets, and new oil seals at the front and rear of the crank. Next we installed the oil pan in torqued all the fasteners to their proper specs. Dad and I then commenced to mask the block for painting. Using masking tape and some of the packing paper from the parts we purchased, we carefully covered all of the surfaces which would not be painted (e.g. the intake manifold and new aluminum timing cover). I inserted balled-up wads of paper in exhaust ports, screw holes, vents and other various apertures in the block and inserted the old spark plugs to cover the threads in the spark plug holes. 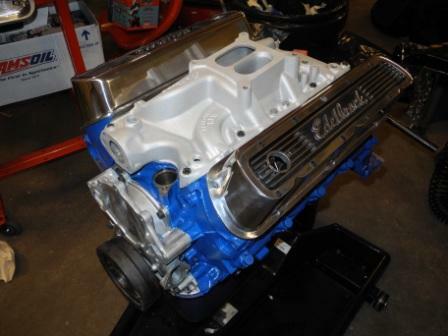 Once the important parts were covered, we sprayed the block down with the Ford-Blue Aervoe paint we picked up at Al Hubbard’s Machine Shop in Hayward. The result was really beautiful! Although we didn’t finish the complete engine assembly before heading off on our annual winter pilgrimage to the snow-covered steeps of Little Cottonwood Canyon, we are looking forward to soon announcing that “major engine assembly operations at the Three Lions Garage have ended”. 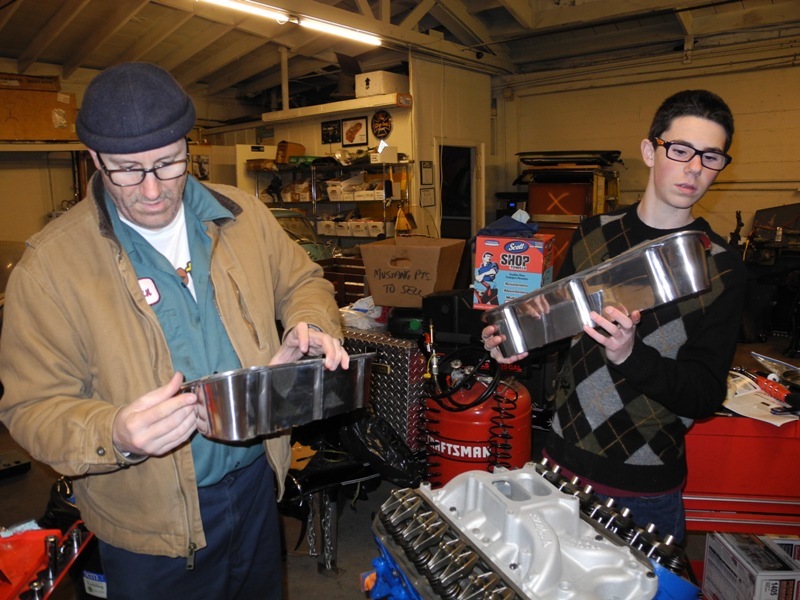 test fitting the Valve Covers - note intense concentration faces! P.S. Dad’s friend Mark stopped in for a visit with my pals Eric and Jack to check out the Mustang and the garage. Jack is considering a notchback project of his own in the near future, and I hope he left TLG with some inspiration and ideas. Oops. Sorry I haven’t posted much lately… between the play, finals, and what little is left over for my social life, there hasn’t been much time to work at the garage. Thank heavens it’s winter break now. Last weekend, we inserted the front oil seal into the timing chain cover. After warping the first two that came with our engine kit, Dad was finally able to fit the replacement we got at Kragen of South City with the seal driver set we bought there. We then installed the gasket for the timing chain cover with silicone sealer, torqued down the cover, and trimmed the extraneous pieces of gasket. 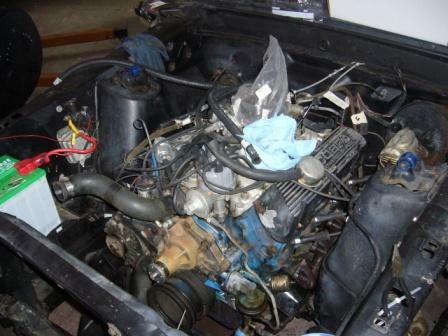 We also got the left cylinder gasket and head installed before it was time to pack up. Today we installed the second cylinder head and started on the valve train. With the lifters and bores lubed nice and proper, in went the pushrods. Next, we lubed the inside of the rocker arms, inserted the pivots, and placed them over the screw-in studs. Oddly enough, there were two types of pivots, but they fit just the same, so we’re hoping there are no problems. We hand-tightened the nuts, and were researching the proper rocker arm-to-valve clearance when it was time to go. Before going home, we picked up some gasket shellac from NAPA Auto Parts so we can install the intake manifold tomorrow. The guy at the Napa counter was very helpful, and pointed us to a sale at Vic Hubbard Speed and Marine, so we’ll be driving there tomorrow for an electronic ignition setup for the mustang. You are currently browsing the Three Lions Garage archives for December, 2010. 51 mySQL queries in 0.180 seconds.